Finally the waiting days pay off, here's the videos of Yoon Kye Sang "Real Mate"
Beside deciding to star in a new movie, Yoon Kye Sang will join a cooking program in Olive Channel. The program will be broadcasted in August. Olive Channel casts Kye Sang for their program since in many interviews he always mentions his passion in cooking. I think if we watch back how he ate and commented the food during his travel program in Turkey, we know that Kye Sang knows about cooking. We wait how Kye Sang 'chef'' looks in his cooking outfit. The latest update is Real Mate. Kye Sang program will be aired tonight July 24th at 11 PM Korean time in QTV. Don't miss it ! 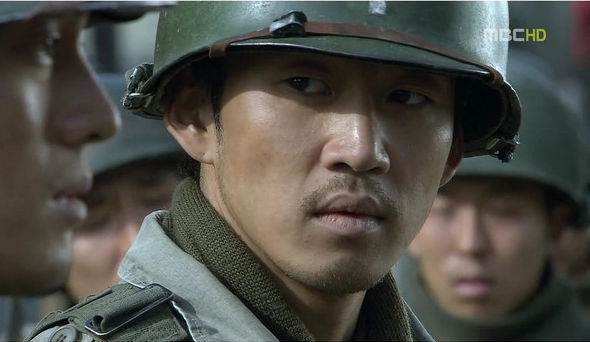 Here's the trailer of Kye Sang's Real Mate . Yoon Kye Sang Cast For : "Becoming An Actor"
Actor Yoon Kye-sang has been cast for the main role of the movie "Becoming An Actor". A List Entertainment announced, "He wanted to do this as soon as he saw the scenario. Yoon is already engrossed in the character". "Becoming An Actor" is about an actor named Seong-woo who's been in various movies but not recognized by anyone, pretending to be the lost development disabled son of a wealthy home to pay off debts for his father who is down with the stroke. Yoon takes on the role of Seong-woo who lands himself in a main role for the first time but is not granted a single NG. Yoon said, "I had fun reading the scenario the first time. I am happy to be in this movie and it's going to be another challenge for me". "Becoming An Actor" will crank up in September. This is Yoon Kye Sang's message in his official fans site, thanks to Tukky Yoon who constantly gives the latest news of Kye Sang. The translation may not 100% precisely what he said but it's closer to what he said. Please forgive us for the poor translation. "Hello everyone, long time no see. I am doing fine and I rest a lot after the treatment of my waist. It's a healing time for me. It's really hard to walk properly and I need to learn seriously. Nowadays, I am thinking a lot of my old times, who am I , do I become an actor because I am lucky or I really deserve to become one. This thought somehow cannot really leave my mind and my heart. This year my truly challenge is to find my real identity, I'm still worried about a lot of things; I even worry to drink now. I'm still thinking about me as an actor and me as Yoon Kye Sang. I feel that I am still young and greedy. And I am still thinking a lot of things....so please wait. I haven't decided to take any work yet , I am looking for something that move my heart. Yoon Kye Sang has still a lot of things to learn, so dear love (fans) please wait for me ; I want a good work and good acting so please be patient sooner and later we will meet again. Now It's raining a lot the real summer has come, hot and wet. Beware with food poisoning pest. I am still looking for my identity and I will be back with new energy and do well again, until then ...I love you all....."
I was so shocked when I first read his news in newsen and chosun that Kye Sang would go through surgery for his spinal herniated disc. The symptom is just a backache. Kye Sang had this injury during the filming of drama : "Road no 1". But his injury becomes worse after filming : "Poongsan Dog", where he made many dangerous scenes. But later I feel relieve that he gets better without going through surgery since he had treatment at oriental hospital where many celebrities also got their treatment here. Kye Sang is very serious with his works, but somehow he overworks his own limb. He has started working in entertainment industry more than decade. he started his carrier as singer ; as one of 'g.o.d' members.I can understand how much he stressed his limb during his singing carrier. Practicing dancing is as hard as acting in dangerous scene. Yoon Kye Sang : How I love the imperfect thee.. 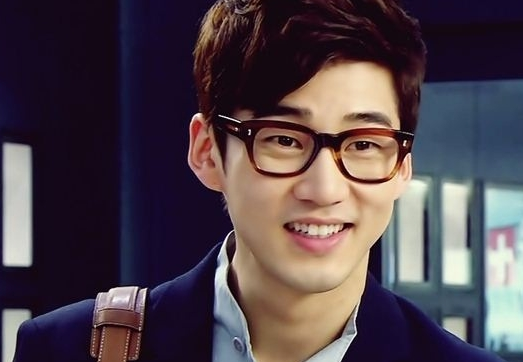 The perfect man Yoon Pil Joo, this is Kye Sang surname in "The Greatest Love Aka Best Love". Who won't fall for a good looking oriental doctor and nice too ? The usual Hong sister second lead actor should be a perfect man but he should never get the girl, that's the rule, which I hate for Kye Sang's case. Watching the character of Yoon Pil Joo's carried by a good actor like Yoon Kye Sang ,add a special 'taste' in Hong sister second lead 'pathetic' character. Somehow Kye Sang adds the extra 'taste' using his own interpretation . As a result Yoon Pil Joo becomes so endearing because he is not pathetic and boring like any other second lead actor in Hong's sister drama. The surname may 'The perfect man Yoon Pil Joo" but in Kye Sang's hand this perfect 'pathetic' character Yoon Pil Joo turns into an out going character, very thoughtful and of course super nice and...funny. This is Kye Sang special recipe to this character. Honestly I never feel sad to Hong sister second character, simply because they deserve not be loved, but Pil Joo is the only character which I feel a deep sadness. If only he is one step faster, Go Ae Jong will fall for him. Frankly speaking I just want Go Ae Jong for him than Dokko Jin. This is an article of 2007, when Kye Sang was still with his old agency sidus HQ. 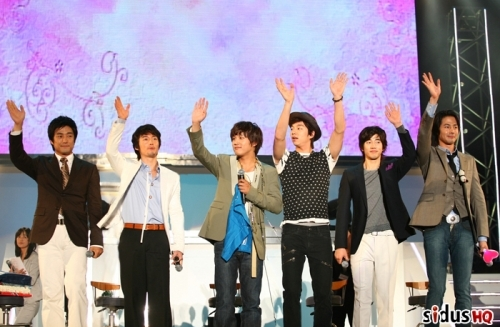 The article is taken from popseoul published on June 26, 2007. Ji Jin Hee kicked off the festival by showing off his sel-ca skills to the audience and he also celebrated his 36th birthday with his fans. Then Jang Hyuk awed the Japanese ajummas with this perfect abs and martial arts. Gong You entered the stage by singing Lee Ki Chan‘s Beautiful Woman (미인), then changed into a high school uniform since he was voted as the the hallyu celeb that looks best in uniforms. Cha Tae Hyun and Yoon Kae Sang sang ballads, which isn’t surprising since they were singers in the past. Then, Zo In Sung finished off this heated festival by arriving on his motorcycle. Although this grand entrance was totally unnecessary, ajummas were screaming their lungs out by this extra “cool” effect. Zo In Sung also held a Q&A session so the audience has a chance to get to know him better. For you who miss Kye Sang singing at the stage I post for you this video, enjoy !